Before you get all, “Man, GWS sure is getting lazy if he’s starting to post LOLCATZ…” you should know that, yes… I am lazy. 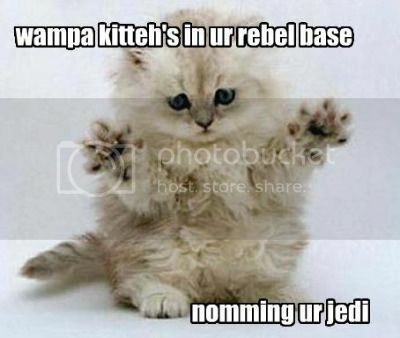 Second, I set a precedent with Jabba the Cat. A glorious, glorious precedent. Third, I can’t resist a wampa gag. This has been well-documented, and you can only blame yourself for your forgetfulness/obliviousness. Via Vactor, whose rare immunity to wampa gags has been documented by medical journals.